My Life. My Music. Your Voyeurism. It’s really amazing what music can stir up in a person. You know how it is. You hear a song on the radio/iPod/etc that just shoots you back in time. Last night’s show at the new Emo’s East did just that. It was a high school flashback for sure. I first saw Anthrax and Testament together in 1987 at the now defunct Boathouse in Norfolk, VA. To this day that hails as one of the greatest shows I have ever seen. 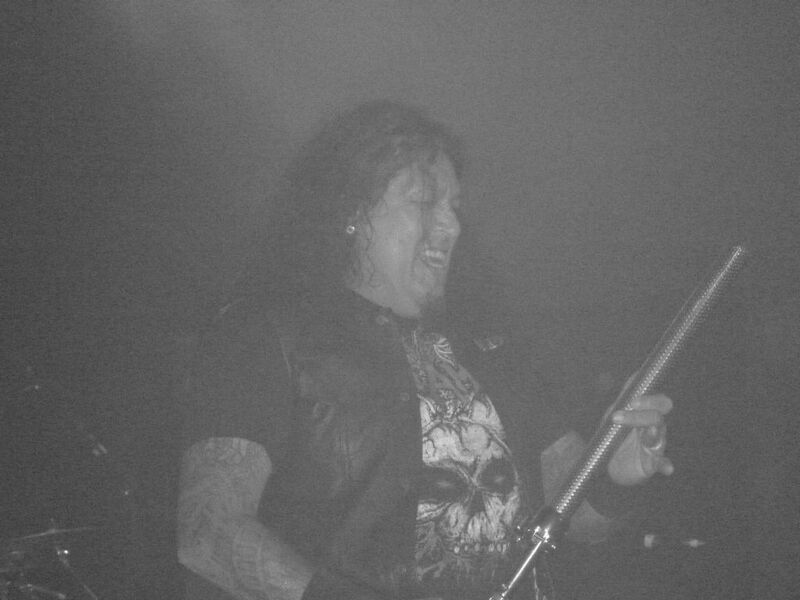 Anthrax was on their Among the Living Tour and Testament was promoting their debut album, The Legacy. Just an awesome show. Death Angel opened the show and I’ll readily admit that I am not a fan. Not for lack of trying, mind you. About every 10 years I’ll listen to their first 3 albums to see if they sound any different to me and they never do. I just couldn’t get into them minus a few songs like Mistress of Pain and Room With A View. My friends here kept saying that I had to see them live and it would change my mind. Well, it didn’t. I went in open-minded (no, really, I swear I did!). They just didn’t do it for me. Sure, they were solid but their brand of thrash just doesn’t settle with me. Rob Cavestany is a fine guitarist, though. He was shredding it up last night. I did get to meet Mark Osegueda at my favorite bar a while later after the show. Fun guy for sure. Super nice. Shots! 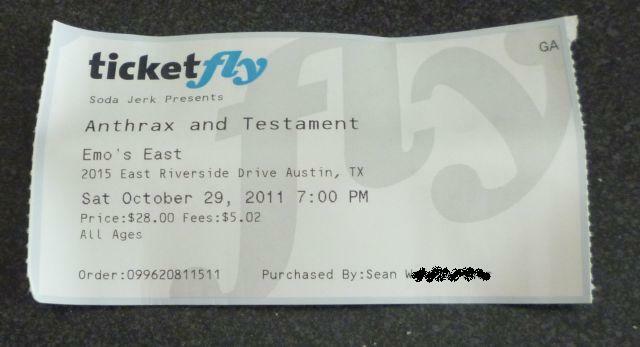 I’ve lamented for years that Testament is the greatest live band ever. They never disappoint and last night they surely didn’t. 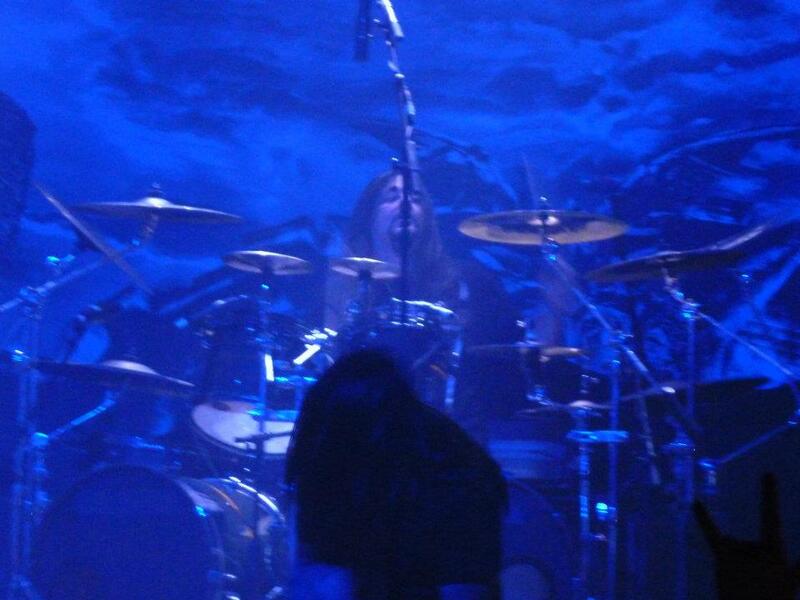 They had Gene Hoglan behind the kit and as always he was perfect with ever hit, every beat. 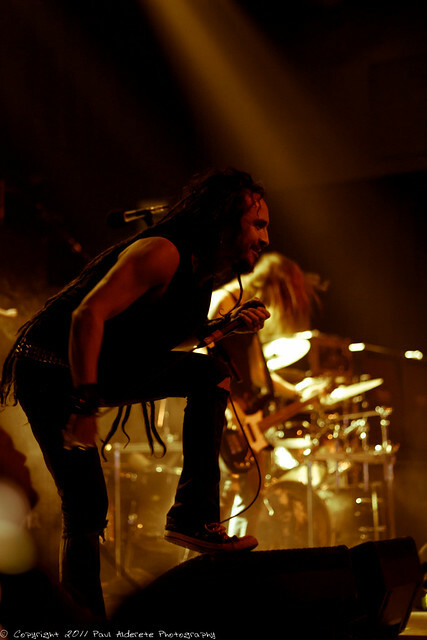 The guy is the greatest metal drummer alive and certainly the most versatile in my opinion. I was hoping to catch up with him and say hi but it wasn’t in the cards, unfortunately. Testament’s set was really strong. They played a good mix of their back catalogue. Chuck was in fine form. Skolnick, while playing great, seemed a light bit bored, like he was going through the motions. I know he is really into his jazz trio these days and maybe playing the metal is taking a back seat, but again, he shredded it perfectly. The whole band was on it, as always. Anthrax…I’ve been a fan since I first bought a used copy of Spreading the Disease on cassette for $3.99 at Unicorn Records in 1986. They were a band that I had read about but not heard yet and Spreading is still my favorite album of theirs to this day. Thanks to the Internet, setlists of previous shows get posted instantly and I was able to see what they had been playing on this tour recently. Great list! The main part of their set had been consistent for most of their shows with the closer changing up a little. Only and Medusa had been played recently and I was really hoping to not hear Only and hear Medusa. You see, they didn’t play Medusa when they were in San Antonio within the last year and I was a little disappointed. Last night, instead of Medusa, they gave us Be All, End All. NOOOOOOOOOOOOOOOOOOOOOOOOOOOOOOOOOOOOOOO! Seriously? Man, I really wanted to hear that one badly. But alas, no dice. I will admit that I left when they started their encore. The went into N.F.L. and I was out. My feet were killing me. Anthrax kills me, though. With a band whose Belladonna era has some really great material, they continue to throw in Antisocial and Got The Time in their set. I would’ve been happy with Belly of the Beast from Persistence of Time and something else a little more obscure like Raise Hell (yeah right, I know I’m dreaming) or even A.I.R. There were a few times during Anthrax’s set that I really felt like it was 1987 all over again. It was a great feeling, albeit a strange one. Stirred up all kinds of stuff. So glad I got to see this show and so glad I got to see most of my favorite Austin folks there. It was quite refreshing. I need more shows like this. NEED! Yours truly, Mark Osegueda, T.A. If you are the guy in the pic at the bottom… I saw ya lol. Paul, those are great! Keep in touch and maybe I can use some of your shots in future posts. And yes, that’s me in the photo! Thanks for checking this out. These are the pics I wish I took! Thanks Bud! What did you think of the new Emo’s East? to be honest, i think it’s set up a bit odd. one big room, bathrooms in odd locations and merch in a normally crowded area. they seem way understaffed at the bars for big shows. they are closing Emos for good on Red River Jan 1 and will open the new inside spot around the same time. Well, it only just opened, so maybe they’re still working the kinks out or are spread thin while both locations are open. We can only hope for improvement! If nothing else, better than the tiny outside stage at the original location (tho boy it had a lot of character). i never really cared for the old outside venue, but do like the old inside. i never got to experience the backroom either. pity, lots of great bands played there. symphony x/iced earth are booked for emo’s east now. glad they’ve got a good new space to bring in mid-level metal bands. 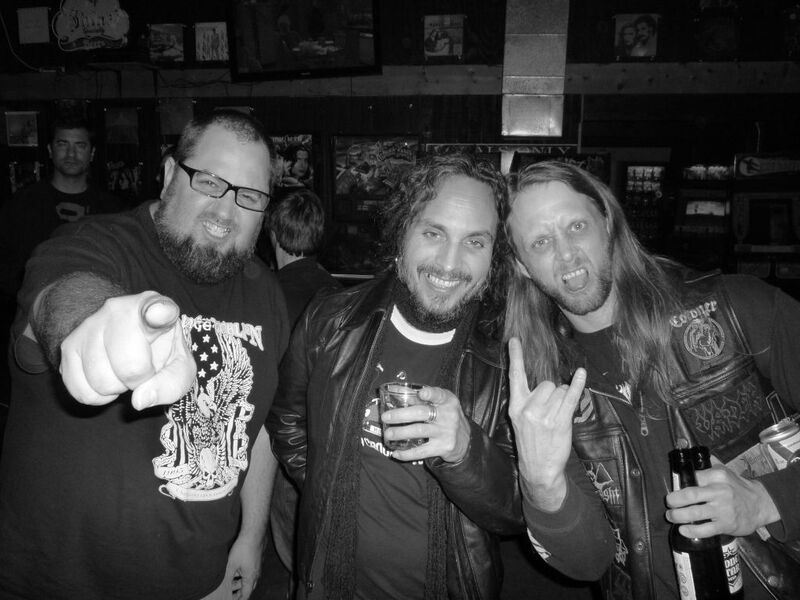 i am seeing a shift from san antonio to austin in the last year or so for metal bands. I was able to go to the Backroom a few times and from what you describe, it SOUNDS like it may be much of the same layout… but I won’t know until I can go there myself. I’m a jet all the way.